The apples on my tree are ripe. It’s time to dig out the apple recipes, which for me means searching for apple recipes in hundred-year-old cookbooks. 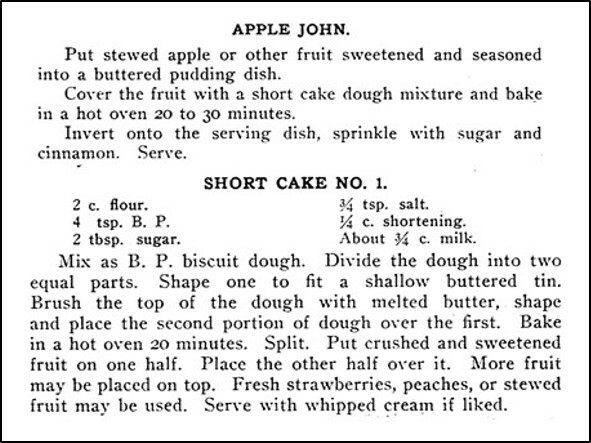 I found a recipe with an unusual name, Apple John. Intrigued, I decided to give it a try. I think I found a winner. The Apple John is kind of like an upside-down cobbler made with shortcake dough. It was tasty, attractive, and easy to make. To make stewed apples, place the sliced apples in a large saucepan, then add sugar, cinnamon, and water. Bring to a boil and then reduce heat. Continue to simmer gently until the apples are soft (approximately 10-15 minutes). If needed, add additional water. 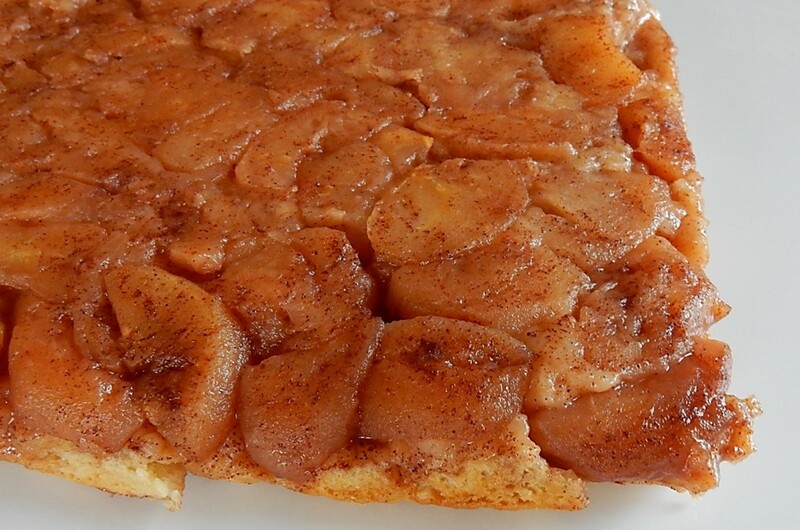 Remove from heat and put the stewed apples in a 9″ X 9″ X 3″ or similar-sized greased baking dish or pan. In the meantime, preheat oven to 425° F. Put flour, baking powder, sugar, and salt in a mixing bowl; stir to combine. Cut the shortening into the flour mixture Add milk and stir just enough to combine using a fork. Drop spoonfuls of the shortcake dough on top of the stewed apples to cover them. Bake in the oven for 20-30 minutes or until the top is lightly browned. Remove from oven and invert on serving plate. Posted on September 24, 2017 September 23, 2017 by SherylPosted in FoodTagged apple, recipe. Previous Previous post: Are Salted Nuts More Digestible Than Unsalted Ones? It’s nice to hear that this post brought back some good food memories. I thought this was going to be a recipe for a beverage. I couldn’t figure out why at first, and then I remembered: applejack was a distilled beverage common in colonial America. I’ve never had it, but clearly I’ve heard enough about it for the word to stick in my mind. Interesting. . . This reminds me that I made a Strawberry Charlotte recipe last summer. I wonder why they gave food people names in the past. I wanted to know what a pudding dish was, but I see you used a square baking tin. This looks yummy! A fairly deep square baking dish works – that said, if I made this recipe again I might try using a round baking dish or pan. I think that it would be easier to find a plate to put it on – and would look better when flipped. This looks so very tasty! Sheryl, you are an elegant blogger and a tireless presenter. I admire you so much. I hope you are giving yourself pats on the back.Some from me, too. I put up a blog and I remembered your lesson of carefully matching the piece with the right photo. So I apologized and pulled the wrong photo and edited an already published blog. You’ll see it. Have some fun!!! I’m honored that you though of me as you worked on your post. I’m humbled. You are so kind. Your new book is off to a great start. The first chapter pulled me right into the story. And, the posted picture works perfectly with the text. My mother would love this. The hubster, too, if he could eat flour. Me not so much with those stewed apples. But it’s a lovely trip down memory lane anyway. What makes shortbread shortbread anyway? I’m glad this recipe brought back some good food memories. I think that “shortbread” is shortbread because it is made with baking powder instead of yeast so it can be made in less time. That said, shortcake seems like it is a subset of the quick bread category. I know it’s different than many quick breads – but I’m not exactly sure why. And I meant short cake, but the ole brain and fingers don’t always work together. Quick bread. I am sure you must be right. Like fruit breads, are those quick breads? Banana nut and all those? Yes, fruit breads are quick breads. I think that you’ll like it. Like you, I’m making lots of apple foods this September. Looks good and it’s interesting to note the number of servings; a recipe for a larger family. Families were typically larger a century ago – and the number of servings were often larger. That said this could be eaten over the course of several days. Yes, it’s always good to have a dish which does for a few days. I don’t think I’ve ever heard of Apple John, looks tasty! Looks delicious! Now I have a hankering for some homemade Apple Crisp!! This looks great! I’m very into the apple recipes right now. This does sound wonderful. I love its simplicity. Apple crisp is one of my favorite things because it’s so simply “apple.” This sounds like it moves right along those same lines. Pass me a scoop of vanilla (or cinnamon) ice cream! My daughter-in-law recently gifted me several quart jars of homemade apple pie filling. It will work perfectly with this recipe. I’d love to bake this. Sounds fantastic. I made this today and it was a huge hit! it reminded me of a plum kuchen my aunt in Germany would make – one of my favorite desserts – haven’t had in years. This was delicious and very easy to make and perfect for a fall rainy day to enjoy with a hot cup of tea.